One of the biggest things happening on the reservations and in urban centers where there are large Native American populations is the “recent gang problem". I've spoken to some tribal elders who want to downplay the problem (denial exists everywhere). What I have personally seen in my work is that the tribes have tried hard to instill cultural pride and teach the traditions to the youth at home and places such as Pow-Wows. Many Native youth are no different than other youth in that they may rebel against the older generation. They may engage in self-destructive behaviors through street gangs. 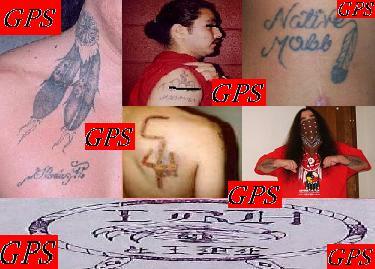 They may just tell the elders they have Native Pride, but NP may also be a gang, it depends. Many of these youth were exposed to gangs in big U.S. cities, thus they have borrowed heavily from major groups, SUR 13, Crips, Bloods, Folks, etc. Many of the tribes have tried to bring youth back to the reservations as well as provide jobs through the growth of Indian gaming. This has been successful in many respects, but the gang affiliated youth may see a jackpot and use their money for criminal acts. Native American street gang members will visit rural communities to recruit members. There is evidence that some Native gangs are also working with Outlaw Motorcycle Gangs in the U.S. and in Canada. Hopefully, Native youth like other youth, will see that this is not the way to meet their needs.